Whether you are camping in a tent, have rented an RV to go on your dream cross-country vacation, or are getting out with the family with your trailer, chances are that you haven’t yet considered the toilet facilities. Or perhaps you are already doing your research on suitable, portable restrooms and that’s what has brought you to this review. Regardless, here are our top recommendations. While you might not quite be able to find a toilet like the one at home, there are some reasonably decent portable toilets on the market these days that are ideal for camping trips. Nobody wants to get caught short in the wilderness, and there is, after all, something strangely comforting about sitting on your very own seat! So it makes sense, especially if you are a regular camper, to invest in facilities that will make your trip as comfortable as possible. Portable toilets and showers elevate the camping experience to something altogether more refined! You might even go so far as to call it the VIP treatment, and certainly you will be happy to have your own facilities close on hand when the call of nature hits you at 3am. When looking for a portable toilet, the ultimate goal is to purchase something as close to what you have at home as possible, bar the plumbing system of course! By that we mean that you want to be looking for a fully functioning toilet that combines ease of use, cleaning, and maintenance with comfort and durability. Here we review three of our top recommendations in the category. 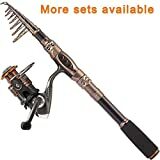 Camco is a name that you will probably see on plenty of recommended product lists, as they are known for their quality and dependable goods. Let’s face it: you want to put your precious goods in the safest pair of hands! This model is budget friendly, too, so is well worth considering if you do regularly camp out with the family. 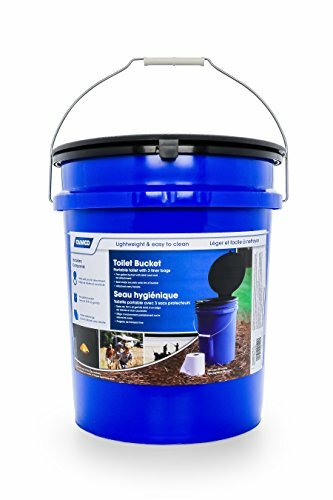 It has a sizeable five gallon bucket with a secure snap-shut lid which prevents spillage and odors from leaking out. It also has a toilet seat attachment for your extra comfort that securely fits the rim. The unit itself is constructed from a durable material that has been UV coated, so it can be used whatever the weather and can just be wiped down to maintain proper hygiene and cleanliness. This is the ultimate portable, cost-effective outdoor toilet, perfect for your camping, boating, and hunting trips where you know access to facilities is going to be problematic. It features a contoured seat for a comfortable home-style experience, and the whole unit is entirely self-contained. There is a removable inner chamber which means that any waste can be quickly, efficiently, and cleanly disposed of. It’s also a very lightweight design weighing just 5 pounds, so it is easy to pack and take with you on all your camping and outdoor adventures. The most significant advantage of the Hassock really has to be that separate, removable internal bucket. Not only does that mean that clean-up is child’s play, but it also ensures that any nasty odors are kept to an absolute minimum. The toilet paper holder is also a neat and convenient little added feature. No matter what your stature and size, this portable camping toilet should easily hold your weight and provide a secure and dependable seated surface. 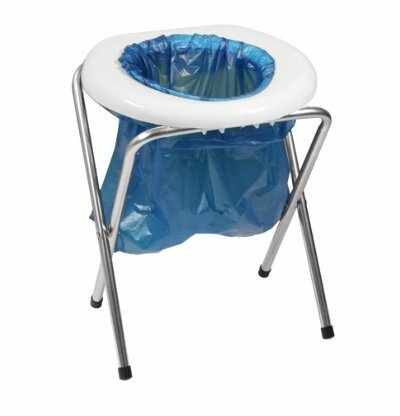 Based on a folding, heavy-duty frame complete with a plastic seat for your comfort and plastic bags to collect your waste, this is a basic but totally functional portable camping toilet. There are no frills, and there is nothing fancy about this unit, but it does the job it’s intended to do and saves you from having to go searching in the evening for a suitable alternative toilet. It’s an inexpensive option and should hold up to 260 lbs, so it’s sturdy enough to support even the larger among you. Rothco has a background and experience in military products, also supplying tactical, survival, and outdoor products for your camping convenience. You might want to invest in a portable toilet from a company with such a reputation. If you are serious about your camping, hunting, or even boating trips, then you will really appreciate the convenience that having your own easily accessible portable toilet can give you. There is nothing worse than having to leave your tent in the pitch dark, dead of night to try and find a convenient facility, so a portable restroom really is a savvy investment for any intrepid travelers. All three of these product recommendations offer excellent value for money and supreme convenience. If you like the idea of sitting on something that has legs then the Rothco, with its steel folding legs, could be a good option for you. With the Camco unit, you are getting the brand history and their reputation for providing seriously dependable outdoor goods. With its UV coating and heavy-duty construction, there’s no need to worry about spillage. 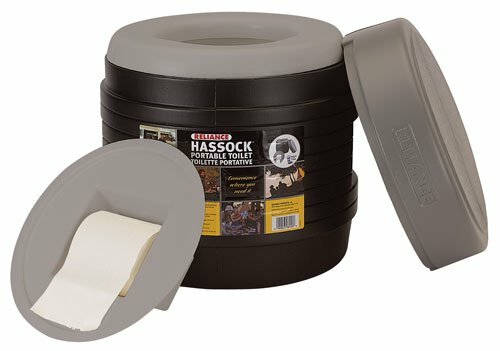 We love the fact that the Hassock portable toilet has a wholly separate and fully removable inner bucket to ensure hygienic disposal of waste. Any three of these products would undoubtedly make a worthwhile purchase and addition to your existing line-up of camping accessories.